One more day at my day job, and then I get to take a few days of vacation. I really need it! I’ve been busy as a bee, trying to finish up some projects. I should have a good stashbuster report this week. I had to do a last minute fleece blanket for a customer. Got that loaded & quilted Tuesday night, trimmed & fringed it yesterday. I’m trying to finish my courthouse steps as a Christmas surprise for my DH, but I think that might be pushing it. But I’m trying! But I do have a finish to report! I finally bound & labeled Simply Leaves. If you have Kim Stotsenberg’s “Just Leaf It” book, you will find this little quilt on the last page. It wasn’t finished yet! Anyway, it is a practice piece I did, trying to do leaves like Kim. I was surprised and thrilled when she asked to include it in her book. At least I finally got that binding done! I am exhausted today, but I thought I needed to post something so you weren’t seeing the same old same old day after day. Love the quilt Randi. I’m going to have to get that book. Glad you are getting to have a few days away from work. It’s lovely and now you can hang it and enjoy it! 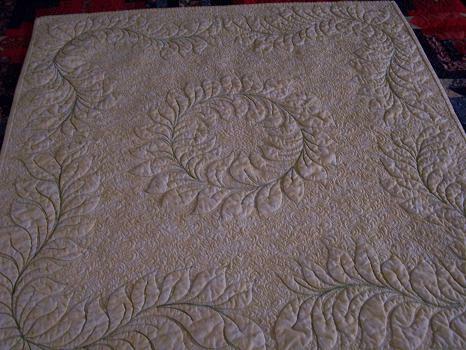 Enjoy your holidays Randi… Very pretty quilt and I am not a leaf person…..
Randi – it is scrumpdillyicious!! I love leaves – maybe more than feathers. Randi…your leave are wonderful!!! It was an honor to include this quilt in my book…:-) Thanks you so much! Randi, that quilt is beautiful! You’ve been published!!! Woohoo! Randi, that looks gorgeous! I *am* a leaf person and I’m in love with that.